We present MPWide, a light weight communication library which allows efficient message passing over a distributed network. MPWide has been designed to connect application running on distributed (super)computing resources, and to maximize the communication performance on wide area networks for those without administrative privileges. It can be used to provide message-passing between application, move files, and make very fast connections in client-server environments. MPWide has already been applied to enable distributed cosmological simulations across up to four supercomputers on two continents, and to couple two different bloodflow simulations to form a multiscale simulation. Modern scientific software is often complex, and consists of a range of hand-picked components which are combined to address a pressing scientific or engineering challenge. Traditionally, these components are combined locally to form a single framework, or used one after another at various locations to form a scientific workflow, like in AMUSE (AMUSE -http://www.amusecode.org) [17,16]. However, these two approaches are not universally applicable, as some scientifically important functionalities require the use of components which run concurrently, but which cannot be placed on the same computational resource. Here we present MPWide, a library specifically developed to facilitate wide area communications for these distributed applications. The main use of MPWide is to flexibly manage and configure wide area connections between concurrently running applications, and to facilitate high-performance message passing over these connections. These functionalities are provided to application users and developers, as MPWide can be installed and used without administrative privileges on the (super)computing resources. We initially reported on MPWide in 2010 , but have since extended the library considerably, making it more configurable and usable for a wider range of applications and users. Here we describe MPWide, its implementation and architecture, requirements and reuse potential. MPWide was originally developed as a supporting communication library in the CosmoGrid project . Within this project we constructed and executed large cosmological N-body simulations across a heterogeneous global network of supercomputers. The complexity of the underlying supercomputing and network architectures, as well as the high communication performance required for the CosmoGrid project, required us to develop a library that was both highly configurable and trivial to install, regardless of the underlying (super)computing platform. There are a number of tools which have similarities to MPWide. ZeroMQ , is a socket library which supports a wide range of platforms. However, compared with MPWide it does have a heavier dependency footprint. Among other things it depends on uuid-dev, a package that requires administrative privileges to install. In addition, there are several performance optimization parameters which can be tweaked with MPWide but not with ZeroMQ. Additionally, the NetIBIS  and the PadicoTM  tools provide functionalities similar to MPWide, though NetIBIS is written in Java, which is not widely supported on the compute nodes of supercomputers, and PadicoTM requires the presence of a central rendez-vous server. For fast file transfers, alternatives include GridFTP and various closed-source file transfer software solutions. There are also dedicated tools for running MPI applications across clusters [11,14,2] and for coupling applications to form a multiscale simulation (e.g., MUSCLE  and the Jungle Computing System ). MPWide has been applied to support several research and technical projects so far. In this section we summarize these projects, the purpose for which MPWide has been used in these projects, and the performance that we obtained using MPWide. MPWide has been used extensively in the CosmoGrid project, for which it was originally developed. In this project we required a library that enabled fast message passing between supercomputers and which was trivial to install on PCs, clusters, little Endian Cray-XT4 supercomputers and big Endian IBM Power6 supercomputers. In addition, we needed MPWide to deliver solid communication performance over light paths and dedicated 10Gbps networks, even when these networks were not optimally configured by administrators. In CosmoGrid we ran large cosmological simulations, and at times in parallel across multiple supercomputers, to investigate key properties of small dark matter haloes . We used the GreeM cosmological N-body code , which in turn relied on MPWide to facilitate the fast message-passing over wide area networks. Our initial production simulation was run distributed, using a supercomputer at SurfSARA in Amsterdam, and one at the National Astronomical Observatory of Japan in Tokyo . The supercomputers were interconnected by a lightpath with 10 Gigabit/s bandwidth capacity. Our main simulation consisted of 20483 particles, and required about 10% of its runtime to exchange data over the wide area network. We subsequently extended the GreeM code, and used MPWide to run cosmological simulations in parallel across up to 4 supercomputers . We also performed a distributed simulation across 3 supercomputers, which consisted of 20483 particles and used 2048 cores in total . These machines were located in Espoo (Finland), Edinburgh (Scotland) and Amsterdam (the Netherlands). The run used MPWide version 1.0 and lasted for about 8 hours in total. We present some performance results of this run in Fig.1, and also provide the performance of the simulation using one supercomputer as a reference. 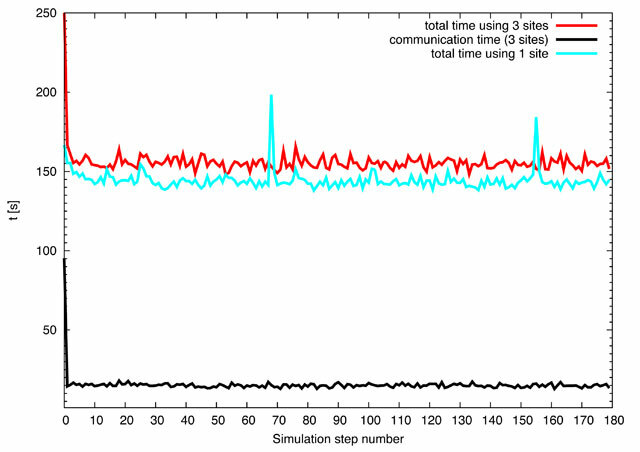 The distributed simulation is only 9% slower than the one executing on a single site, even though simulation data is exchanged over a baseline of more than 1500 kilometres at every time step. A snapshot of our distributed simulation, which also features dynamic load balancing, can be found in Fig.2. The results from the CosmoGrid project have been used for the analysis of dark matter haloes  as well as for the study of star clusters in a cosmological dark matter environment [18,19]. Comparison of the wallclock time required per simulation step between a run using 2048 cores on one supercomputer (given by the teal line), and a nearly identical run using 2048 cores distributed over three supercomputers (given by the red line). The two peaks in the performance of the single site run were caused by the writing of 160GB snapshots during those iterations. The run over three sites used MPWide to pass data between supercomputers. The communication overhead of the run over three sites is given by the black line. See Groen et al. for a detailed discussion on these performance measurements. Snapshot of the cosmological simulation discussed in Fig.1, taken at redshift z = 0 (present day). 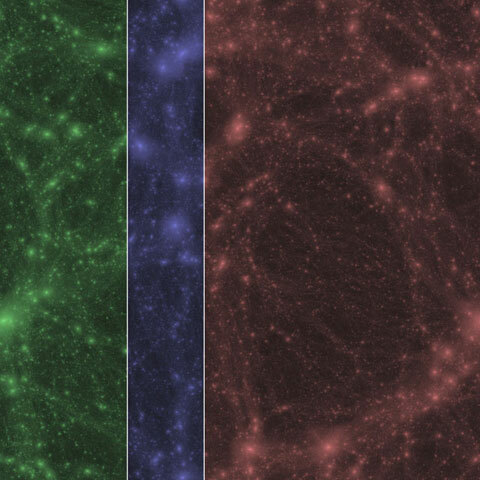 The contents have been colored to match the particles residing on supercomputers in Espoo (green, left), Edinburgh (blue, center) and Amsterdam (red, right) respectively . We have also used MPWide to couple a three-dimensional cerebral bloodflow simulation code to a one-dimensional discontinuous Galerkin solver for bloodflow in the rest of the human body . Here, we used the 1D model to provide more realistic flow boundary conditions to the 3D model, and relied on MPWide to rapidly deliver updates in the boundary conditions between the two codes. We ran the combined multiscale application on a distributed infrastructure, using 2048 cores on the HECToR supercomputer to model the cerebral bloodflow and a local desktop at University College London to model the bloodflow in the rest of the human body. The two resources are connected by regular internet, and messages require 11 ms to traverse the network back and forth between the desktop and the supercomputer. We provide an overview of the technical layout of the codes and the communication processes in Fig.3. The communications between these codes are particularly frequent, as the codes exchanged data every 0.6 seconds. However, due to latency hiding techniques we achieve to run our distributed simulations with neglishible coupling overhead (6 ms per coupling exchange, which constituted 1.2% of the total runtime). A full description of this run is provided by Groen et al. .
Overview of the codes and communication processes in the distributed multiscale bloodflow simulation. Here the 1D pyNS code uses MPWide to connect to an MPWide data forwarding process on the front-end node of the HECToR supercomputer. The 3D HemeLB code, which is executed on the compute nodes of the HECToR machine also connects to this data forwarding process. The forwarding process allows us to construct this simulation, even when the incoming ports of HECToR are blocked, and when the nodes where HemeLB will run are not known in advance. Once the connections are established, the simulations startd and boundary data is exchanged between the codes at runtime. We have used MPWide for several other purposes. First, MPWide is part of the MAPPER software infrastructure , and is integrated in the MUSCLE2 coupling environment (MUSCLE2 - http://www.qoscosgrid.org/trac/muscle). Within MUSCLE2, MPWide is used to improve the wide area communication performance in coupled distributed multiscale simulation . Additionally, we applied the mpw-cp file transferring tool to test the network performance between the campuses of University College London and Yale University. In these throughput performance tests we were able to exchange 256 MB of data at a rate of ~8 MB/s using scp, a rate of ~40 MB/s using MPWide, and a rate of ~48 MB/s using a commercial, closed-source file transfer tool named Aspera. We have conducted a number of basic performance tests over regular internet, comparing the performance of MPWide with that of ZeroMQ (ZeroMQ - http://www.zeromq.org), MUSCLE 1 and regular scp. During each test we exchanged 64MB of data (in memory in the case of MPWide, MUSCLE and ZeroMQ, and from file in the case of scp), measuring the time to completion at least 20 times in each direction. We then took the average value of these communications in each direction. In these tests we used ZeroMQ with the default autotuned settings. Summary of the throughput performance tests using MPWide and several other tools to exchange data between resources in the United Kingdom (UK), the Netherlands (NL) and Poland (PL) using regular internet. Tests over individual connections were performed in quick succession to mitigate potential bias due to background load on the internet backbone. A full report on these tests can be found at http://www.mapper-project.eu, Deliverable 4.2 version 0.7. We present a basic overview of the MPWide architecture in Fig.4. MPWide has been implemented with a strong emphasis on minimalism, relying on a small and flexible codebase which is used for a range of functionalities. The core MPWide functionalities are provided by the MPWide C++ API, the communication codebase, and the Socket class. Together, these classes comprise about 2000 lines of C++ code. The Socket class is used to manage and use individual tcp connections, while the role of the communication codebase is to provide the MPWide API functionalities in C++, using the Socket class. We provide a short listing of functions in the C++ API in Table 2. More complete information can be found in the MPWide manual, which resides in the /doc subdirectory of the source code tree. MPWide relies on a number of data structures, which are used to make it easier to manage the customized connections between endpoints. The most straightforward way to construct a connection in MPWide is to create a communication path. Each path consists of 1 or more tcpstreams, each of which is used to facilitate actual communications over that path. Using a single tcp stream is sufficient to enable a connection, but in many wide area networks, MPWide will deliver much better performance when multiple streams are used. MPWide supports the presence of multiple paths, and the creation and deletion of paths at runtime. In addition, any messages can be passed from one path to another using MPW_Cycle(), or MPW_Relay() for sustained dedicated data forwarding processes (See Tab. 2). MPWide comes with a number of parameters which allow users to optimize the performance of individual paths. Aside from varying the number of streams, users can modify the size of data sent and received per low-level communication call (the chunk size), the tcp window size, and limit the throughput for individual streams by adjusting the communication pacing rate. The number of streams will always need to provided by the user when creating a path, but users can choose to have the other parameters automatically tuned by enabling the MPWide autotuner. The autotuner, which is enabled by default, is useful for obtaining fairly good performance with minimal effort, but the best performance is obtained by testing different parameters by hand. When choosing the number of tcp streams to use in a path, we recommend using a single stream for connections between local programs, and at least 32 streams when connecting programs over long-distance networks. We have found that MPWide can communicating efficiently over as many as 256 tcp streams in a single path. Overview of MPWide functionalities and their links to underlying components. Functionalities available to the user are given by black arrows, links of these functionalities to the corresponding MPWide API by red lines, and internal codebase dependencies by dark blue lines. List of available functions in the MPWide API. MPW_Barrier() Synchronize between two ends of the network. MPW_CreatePath () Create and open a path consisting of 1+ tcpstreams. MPW_Cycle () Send buffer over one set of channels, receive from other. MPW_DCycle () As MPW_Cycle (), but with buffers of unknown size using caching. MPW_DestroyPath () Close and destroy a path consisting of 1+ tcp streams. MPW_DNSResolve () Obtain an IP address locally, given a hostname. MPW_DSendRecv () Send/receive buffers of unknown size using caching. MPW_Finalize () Close connections and delete MPWide buffers. MPW_Recv () Receive a single buffer (merging the incoming data). MPW_Relay () Forward all traffic between two channels. MPW_Send () Send a single buffer (splitted evenly over the channels). MPW_SendRecv () Send/receive a single buffer. MPW_ISendRecv () Send and/or receive data in a non-blocking mode. MPW_Has_NBE_Finished () Check if a particular non-blocking call has completed. MPW_Wait () Wait until a particular non-blocking call has completed. MPW_setAutoTuning () Enable or disable autotuning (default: enabled). MPW_setChunkSize () Change the size of data sent and received per low-level tcp send command. MPW_setPacingRate () Adjust the software-based communication pacing rate. MPW_setWin () Adjust the tcp window size within the constraints of the site configuration. We have constructed a Python interface, allowing MPWide to be used through Python (Python - http://www.python.org). We construct the interface using Cython (Cython - http://www.cython.org), so as a result a recent version of Cython is recommended to allow a smooth translation. The interface works similar to the C++ interface, but supports only a subset of the MPWide features. It also includes a Python test script. We also implemented an interface using SWIG, but recommend Cython over SWIG as it is more portable. It is not uncommon for supercomputing infrastructures to deny direct connections from the outside world to compute nodes. In privately owned infrastructures, administrators commonly modify firewall rules to facilitate direct data forwarding from outside to the compute nodes. The Forwarder is a small program that mimicks this behavior, but is started and run by the user, without the need for administrative privileges. Because the Forwarder operates on a higher level in the network architecture, it is generally slightly less efficient than conventional firewall-based forwarding. An extensive example of using multiple Forwarder instances in complex networks of supercomputers can be found in Groen et al. .
Mpw-cp is a command-line file transfer tool which relies on SSH. Its functionality is basic, as it essentially uses SSH to start a file transfer process remotely, and then links that process to a locally executed one. Mpw-cp works largely similar to scp, but provides superior performance in many cases, allowing users to tune their connections (e.g., by using multiple streams) using command-line arguments. The DataGather is a small program that allows users to keep two directories synchronized on remote machines in real-time. It synchronizes in one direction only, and it has been used to ensure that the data generated by a distributed simulation is collected on a single computational resource. The DataGather can be used concurrently with other MPWide-based tools, allowing users to synchronize data while the simulation takes place. MPWide has a number of constraints on its use due to the choices we made during design and implementation. First, MPWide has been developed to use the tcp protocol, and is not able to establish or facilitate messages using other transfer protocols (e.g. udp). Second, compared to most MPI implementations, MPWide has a limited performance benefit (and sometimes even a performance disadvantage) on local network communications. This is because vendor MPI implementations tend to contain architecture-specific optimizations which are not in MPWide. Third, MPWide does not support explicit data types in its message passing, and treats all data as an array of characters. We made this simplification, because data types vary between different architectures and programming environments. Incorporating the management of these in MPWide would result in a vast increase of the code base, as well as a permanent support requirement to update the type conversions in MPWide, whenever a new platform emerges. We recommend that users perform this serialization task in their applications, with manual code for simple data types, and relying on a high-quality serialization libraries for more complex data types. MPWUnitTests - A set of basic unit tests, can be run without any additional arguments. MPWTestConcurrent - A set of basic functional tests, can be run without any additional arguments. MPWTest - A benchmark suite which requires to be started manually on both end points. More details on how to use these tests can be found in the manual, which is supplied with MPWide. MPWide is suitable for most Unix environments. It can be installed and used as-is on various supercomputer platforms and Linux distributions. We have also been able to install and use this version of MPWide successfully on Mac OS X.
MPWide requires a C++ compiler with support for pthreads and UNIX sockets. MPWide has no inherent hardware requirements. MPWide itself has no major dependencies. The mpw-cp functionality relies on ssh and the Python interface has been tested with Python 2.6 and 2.7. The Python interface has been created using SWIG, which is required to generate a new interface for different types of Python, or for non 64-bit and/or non-Linux platforms. Derek Groen, has written most of MPWide and is the main contributor to this writeup. Steven Rieder, assisted in testing MPWide, provided advice during development, and contributed to the writeup. Joris Borgdorff, provided advice on the recent enhancements of MPWide, and made several recent contributions to the codebase. Cees de Laat, provided advice during development and helped arrange the initial Amsterdam-Tokyo lightpath for testing and production. Paola Grosso, provided advice during development and in the initial writeup of MPWide. Tomoaki Ishiyama, contributed in the testing of MPWide and implemented the first MPWide-enabled application (the GreeM N-body code). Hans Blom, provided advice during development and conducted preliminary tests to compare a tcp-based with a udp-based approach. Kei Hiraki, provided advice during development and infrastructural support during the initial wide area testing of MPWide. Keigo Nitadori, provided advice during development. Junichiro Makino, for providing advice during development. Stephen L.W. McMillan, provided advice during development. Mary Inaba, provided infrastructural support during the initial wide area testing of MPWide. Peter Coveney, provided support on the recent enhancements of MPWide. MPWide has been released under the Lesser GNU Public License version 3.0. GitHub uses the git repository system. The full MPWide distribution contains code written primarily in C++, but also contains fragments written in C and Python. The code has been commented and documented solely in English. MPWide has been designed with a strong emphasis on reusability. It has a small codebase, with minimal dependencies and does not make use of the more obscure C++ features. As a result, users will find that MPWide is trivial to set up in most Unix-based environments. MPWide does not receive any official funding for its sustainability, but the main developer (Derek Groen) is able to respond to any queries and provide basic assistance in adapting MPWide for new applications. MPWide can be reused for a range of different purposes, which all share one commonality: the combination of light-weight software with low latency and high throughput communication performance. MPWide can be reused to parallelize an application across supercomputers and to couple different applications running on different machines to form a distributed multiscale simulation. A major advantage of using MPWide over regular tcp is the more easy-to-use API (users do not have to cope with creating arrays of sockets, or learn low-level tcp calls such as listen() and accept()), and built-in optimizations that deliver superior performance over long-distance networks. In addition, users can apply MPWide to facilitate high speed file transfers over wide area networks (using mpw-cp or the DataGather). MPWide provides superior performance to existing open-source solutions on many long-distance networks (see e.g., section [Sec:OtherResearch]). MPWide could also be reused to stream visualization data from an application to a visualization facility over long-distances, especially in the case when dedicated light paths are not available. Users can also use MPWide to link a Python program directly to a C or C++ program, providing a fast and light-weight connection between different programming languages. However, the task of converting between data types is left to the user (MPWide works with character buffers on the C++ side, and strings on the Python side). MPWide is not part of any officially funded project, and as such does not receive sustained official funding. However, there are two mechanisms for unofficial support. When users or developers run into problems we encourage them to either raise an issue on the GitHub page or, if urgent, to contact the main developer (Derek Groen, djgroennl@gmail.com) directly. MPWide is largely intended as stand-alone and a very light-weight communication library, which is easy to maintain and support. To make this possible, we aim to retain a very small codebase, a limited set of features, and a minimal number of dependencies in the main distribution. As such, we are fairly strict in accepting new features and contributions to the code on the central GitHub repository. We primarily aim to improve the performance and reliability of MPWide, and tend to accept new contributions to the main repository only when these contributions boost these aspects of the library, and come with a limited code and dependency footprint. However, developers and users alike are free to branch MPWide into a separate repository, or to incorporate MPWide into higher level tools and services, as allowed by the LGPL 3.0 license. We strongly recommend integrating MPWide as a library module directly into higher level services, which then rely on the MPWide API for any required functionalities. MPWide has a very small code footprint, and we aim to minimize any changes in the API between versions, allowing these high-level services to easily swap their existing MPWide module for a future updated version of the library. We have already used this approach in codes such as SUSHI, HemeLB and MUSCLE 2. ZeroMQ (2013). Available at www.zeromq.org. Agullo, E, Coti, C, Herault, T, Langou, J, Peyronnet, S, Rezmerita, A, Cappello, F and Dongarra, J (2011). QCG-OMPI: MPI applications on grids. Future Generation Computer Systems 27(4): 357–369. Aumage, O, Hofman, R and Bal, H (2005). Netibis: an efficient and dynamic communication system for heterogeneous grids.. IEEE Computer Society CCGRID '05: Proceedings of the Fifth IEEE International Symposium on Cluster Computing and the Grid (CCGrid'05). Washington D.C., USA vol. 2: 1101–1108. Borgdorff, J, Mamonski, M, Bosak, B, Groen, D, Ben Belgacem, M, Kurowki, K and Hoekstra, A G (2013). Multiscale computing with the multiscale modeling library and runtime environment. Accepted by the.International Conference for Computational Science. Denis, A, Perez, C and Priol, T (2003). PadicoTM: An open integration framework for communication middleware and runtimes. Future Generation Computer Systems 19(4): 575–585. Drost, N, Maassen, J, van Meersbergen, M, Bal, H, Pelupessy, I, Portegies Zwart, S, Kliphuis, M, Dijkstra, H and Seinstra, F (2012). High-performance distributed multi-model / multi-kernel simulations: A case-study in jungle computing. IEEE Computer Society, Proceedings of the 2012 IEEE 26th International Parallel and Distributed Processing Symposium Workshops & PhD Forum. IPDPSW '12. Washington, D.C., USA: 150–162. Groen, D, Rieder, S and Portegies Zwart, S (2011). High performance cosmological simulations on a grid of supercomputers.. Proceedings of INFOCOMP 2011. Available at http://thinkmind.org/. Hockney, R W (1994). The communication challenge for mpp: Intel paragon and meiko cs-2. Parallel Computing 20(3): 389–398. Ishiyama, T, Fukushige, T and Makino, J (2009). GreeM: Massively Parallel TreePM Code for Large Cosmological N -body Simulations. Publications of the Astronomical Society of Japan 61: 1319–1330. Ishiyama, T, Rieder, S, Makino, J, Portegies Zwart, S, Groen, D, Nitadori, K, de Laat, C, McMillan, S, Hiraki, K and Harfst, S (2013). The cosmogrid simulation: Statistical properties of small dark matter halos. The Astrophysical Journal 767(2): 146. Manos, S, Mazzeo, M, Kenway, O, Coveney, P V, Karonis, N T and Toonen, B R (2008). Distributed mpi cross-site run performance using mpig. HPDC, : 229–230. Portegies Zwart, S, Ishiyama, T, Groen, D, Nitadori, K, Makino, J, de Laat, C, McMillan, S, Hiraki, K, Harfst, S and Grosso, P (2010). Simulating the universe on an intercontinental grid. Computer 43: 63–70. Portegies Zwart, S, McMillan, S, Harfst, S, Groen, D, Fujii, M, Ó Nualláin, B, Glebbeek, E, Heggie, D, Lombardi, J, Hut, P, Angelou, V, Banerjee, S, Belkus, H, Fragos, T, Fregeau, J, Gaburov, E, Izzard, R, Juric, M, Justham, S, Sottoriva, A, Teuben, P, van Bever, J, Yaron, O and Zemp, M (2009). A multiphysics and multiscale software environment for modeling astrophysical systems. New Astronomy 14(4): 369–378. Portegies Zwart, S, McMillan, S L W, van Elteren, E, Pelupessy, I and de Vries, N (2013). Multi-physics simulations using a hierarchical interchangeable software interface. Computer Physics Communications 183: 456–468. Rieder, S, van de Weygaert, R, Cautun, M, Beygu, B and Portegies Zwart, S (2013). Assembly of filamentary void galaxy configurations. MNRAS 435: 222–241. Zasada, S J, Mamonski, M, Groen, D, Borgdorff, J, Saverchenko, I, Piontek, T, Kurowski, K and Coveney, P V (2012). Distributed infrastructure for multiscale computing. Distributed Simulation and Real Time Applications (DS-RT), 2012 IEEE/ACM 16th International Symposium. : 65–74.